I dedicate this weekly post, featuring vintage gay photographs, to the men and women who lived in a more critical time where being true to yourself and loving who you want wasn’t always an option and came at a great price. Do you have a photo you would like to share? Email me at bosguymail@gmail.com. This entry was posted in Gay and tagged BosGuy, Boston Guy, Vintage Gay. Bookmark the permalink. I am not a fan of people giving the finger to the camera. It’s rude and unsexy. 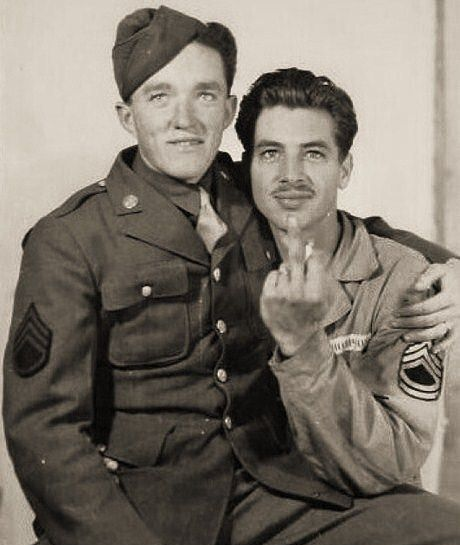 The white name tape on the uniform of the right-hand sergeant (the guy flipping the bird) suggests that the photo would have to date to the Korean conflict or later, since before then the uniform didn’t include the name of the wearer. These guys were anti-Trump before there was Trump!